As a result of breeding quality English pointer bird dogs for over 30 years, Phantom Kennels has developed a line of outstanding dogs that have been tested and proven across the world. Our dogs are used to hunt all upland game birds in North America and used in Europe and even as far as the Canary Islands near Africa . Our goal is to produce tough, classy bird dogs with outstanding noses and a desire to please. Trainability is very important to us, since many of the dogs that we sell come back to our training program. We have been able to directly assess the success of our breeding program as a result of that. A dog that learns quickly is much easier and faster to train. This all goes back to intelligence, a very inheritable trait. There are various bloodlines in the pointer breed today. It is our philosophy and practice to breed to the top All-age type field trial dogs that have been tested at the National Championship in Grand Junction , Tennessee , a three hour endurance stake. If you study the pedigrees of our dogs, you will see many dogs that have not only competed there, but have won the event. These dogs have the class, style, nose, and endurance it takes to produce the type of dogs that we want in our program. They all have demonstrated that they can run big, yet handle. They run huge on the prairies of the Dakotas and Canada and then come back and adapt to the woods of Tennessee , Mississippi , and Georgia or the dryer, rougher country of Texas and Oklahoma . All of these dogs have impeccable manners around their game and all are considered in a class of their own. We believe that the closer one gets to these dogs, the better chances one has of getting a top quality bird dog. There are those that say, �I�m not looking for a field trial dog, just a hunting dog.� It is our experience that field trial dogs produce the best hunting dogs. To produce a field trial dog is not easy, even if you breed to National Champions. The �law of averages� kicks in and most of the time you end up with a class shooting dog that out performs the average hunting dog because of his genetics. Over thirty years ago, I acquired a granddaughter of the great National Ch. Red Water Rex and she became my first great shooting dog. I entered Dan�s Sugar Candy in the Panhandle Bird Dog Club Walking Shooting Dog Stake held on the Gene Howe Game Preserve near Canadian, Texas in the fall of 1977. She easily beat a group of over 20 shooting dogs with 7 wild covey finds in 30 minutes. She was a phenomenal bird dog and taught me more than I could ever teach her. I realized that her bird finding ability was no accident. Her grandsire, National Ch. Red Water Rex won the 70th renewal of the Continental Open Championship with eleven finds! He did this when other noted dogs were not finding birds. Rex won nine Open All-age Championships including the National and the Purina Award twice, two championships and one runner-up of the Continental. National Ch. Dunn�s Fearless Bud, sire of our Ch. 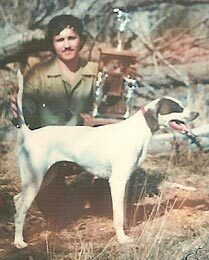 Whippoorwill Razor and Sanel Ochoa, was another tremendous bird dog. He won the 1990 National Championship with 10 wild covey finds and was the 1989-1990 Purina Dog of the year. It is interesting to note that even the late Robert Wehle, founder of Elhew Kennels, found it necessary to breed to the great All-Age National Champions Red Water Rex and Dunn�s Fearless Bud. Remember, the water of a fresh spring becomes polluted, the further downstream you go! Of course, we have some foundation dogs that might have some shooting dogs in their pedigree, but if you follow them back a few generations, you will find the great all-age dogs referred to above. Field trial competition is very important to improving all breeds of bird dogs.